Let's get real: the Military was deployed to the border to prevent nationalists and patriots from opening fire on the incoming migrants. Trump has a lot riding on this situation and how he handles it will have a direct impact on the elections. This may be Trump attempting to find common ground or it may be Trump submitting completely to the globalist agenda. Either way, it looks like no one will be stopped at the border. The president during a prerecorded interview with Fox News's Laura Ingraham said the administration will "hold" the migrants who apply for asylum rather than releasing them pending their court dates, as previous administrations have done. "If they applied for asylum, we’re going to hold them until such time as their trial takes place," Trump told Ingraham. "Where? We have the facilities?" she asked. "We’re going to put up — we’re going to build tent cities," Trump replied. "We’re going to put tents up all over the place. We’re not going to build structures and spend all of this, you know, hundreds of millions of dollars — we’re going to have tents." "They're going to be very nice," he added. Now, this is a yuuge improvement over the previous model of patting illegals on the bum and reminding them to show up for their court date as we release them in to the general population. 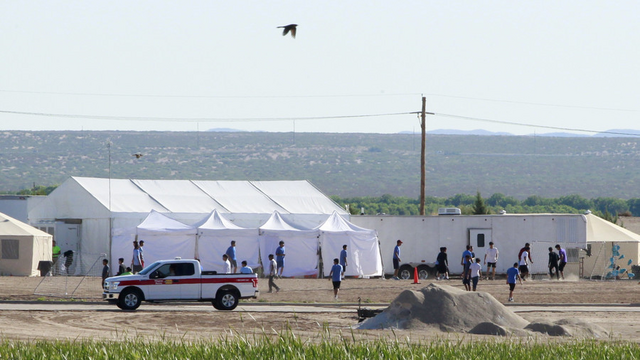 A "tent city" keeps the whole caravan in one location while they are processed, which could "take years". This, in addition to clearly rescinding citizenship rights by birth alone, may be two ways Trump is deterring the caravan while being unable or unwilling to use other methods. I'm not sure if his options are really that limited or if he's done a full 180 on his election promises. I'm leaning towards the latter as he is currently in charge of the most powerful nation on Earth - if the Military was so inclined, they could stop every single migrant at the border with non-lethal means. So why don't they? so we have to feed them and clean their sht for years???? I think you’ll follow the Nauru model and give them food - the rest is up to them. Yes. Thank you for your tax dollars. So, you are going to do what most other countries are doing in dealing with this global crisis. This is not an issue specific to the US. I know you wish everyone would obey your laws and stop bothrin9 you. Goes hand in hand with coming from a place of privilege. Most will return to Mexico as planned. Just like in previous Caravans. You are obsessed Aztec with illegal immigrants. Does it keep you up at Night?
. You are obsessed Aztec with illegal immigrants. Does it keep you up at Night? lol, no actually, i sleep very well at night thank you. what is your issue with usa? what has it done to you so you support invasion??. i think i know, you were too honest once and it bit you hard, right? Well you're 2 years late but we'll done for catching on. wtf is it with you and our privilege? we EARNED that privilege. we do not feel sorry we did. Earned it by screwing over the countries you are now whining about. I'll link the list again of US intervention in Latin America. A history of undermining g populist regimes in favor of military regimes protecting US economic interests. Its historical fact and is directly related to the present situation. Is Trump un-WILLING to stop them or un-ABLE to stop them? That's the million dollar question, as far as I'm concerned. He's been in Office for two years which is usually when we see what the POTUS is really made of. Campaign promises were made a long time ago, he's got his people in positions of power now, so it's time to put up or shut up. sure more blaming America, so convenient these days, well in any case i do not see how i owe them anything. i see them as invaders, nothing else. My family worked for every damn thing we have...I'd tell you what you can do with your "privilege" I was raised a to be a lady. No, I don't blame America for all of Latin American problems. They are responsible for their past actions however. yea, the famous racist video, wants me to feel guilty that i have a functional family had a father figure, no criminal record, have a job, and responsibility for my action, and have parent that do the same, i did not take none of it from another guy, and i will NEVER FEEL GUILTY about it. petty clear this is anti white video for SJW. I know we talked about this before, but legal immigrants don't like illegal immigrants either. They resent the fact they worked so hard, waited their turn and others just waltz in. It also makes people suspect of how they ended up here. It puts a burden on them too.